Clever emails are fun, personal, and engaging. They do as much for the brand which sends them as they do for the customer who receives them. In this article, we will cover not just the best email campaigns, we will also tell you why it works. If you are here, you are probably looking for inspiration for your new campaign. If you are indeed in the process of hiring an expensive copywriter, you can evaluate his/her submitted work and if need be, ask for revisions. The message contained in a brand’s email campaign can neither be so broad that it fails to interest the customer nor can it be too focused and bores the customer. A less than perfect subject line could lead to your email not being opened at all. Your subject line is a psychological tool; use it to grab attention. You have to ensure what you say in the body is effective in making the customer click on the call-to-action; there’s no space for fluff. They create customized photo books and other gift items. This example follows a very basic rule for email campaigns – make it visual! The image they have used symbolizes that “the lines are open”. They have also used the simple, minimal design with yellow as the main color; it grabs the eye immediately. What I like most about this email is the purpose they have used it for. 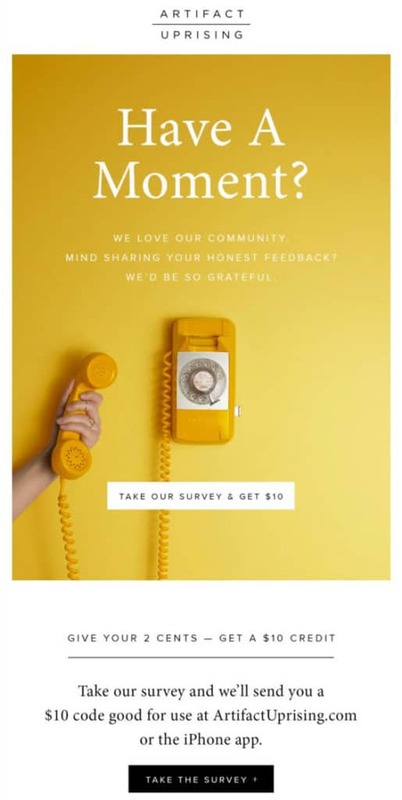 Customer surveys are the toughest to generate clicks on the CTA. People usually will click very quickly if it is a sale where they are saving X dollars. So they paired this lively image with a $10 gift coupon. Who doesn’t like ice cream? Answer: Everyone loves ice cream. J. Crew wanted to lure customers in for a sale, so they put a universally likable item to a great use. The image begins with a short sentence promising a guaranteed feel-good return at the end of the scroll. As customer begins scrolling down the large ice cream, he might think he is getting a sweet treat. Curiosity is at the peak when the user reaches the end. Instead of directly answering “what this email is about”, the email ends a rather mysterious black CTA button with one word “Go”. This email relies on minimalism and sound psychological principles to make the customer click on the CTA. There are so many taxi-hailing apps. None of them has been as successful and loved as Uber. What I love about Uber is its no-nonsense approach to user experience. The moment you fire up the app, you are selecting your destination. You don’t waste time in clicking on irrelevant messages; the app takes you right down to business. The same is often reflected in Uber’s email campaigns too. 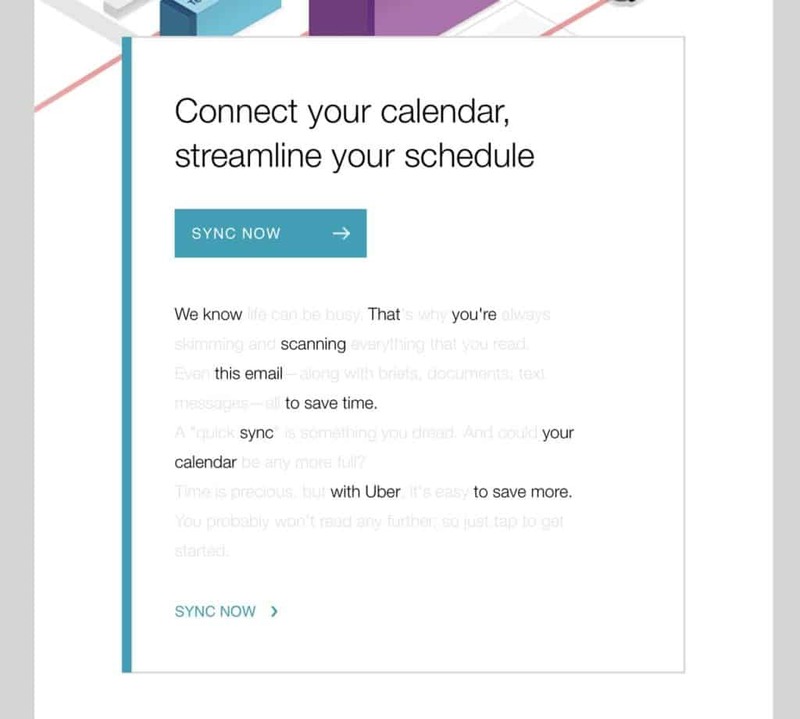 The example given below is an email for brand loyalty which attempts to persuade the customer to link their calendars with the Uber app. It is minimal and very cheeky. Look at the way they used text to mimic the mental state of anyone who is reading a promotional email. This is one of the cleverest campaigns you will ever see. If I could, I would frame it for my company’s wall. This is by far the most creative ad I have ever seen. Poncho is an app which simply sends weather information – via a cat. The messages sent by the app are not exactly very peppy but the fact that they’re delivered by a cute cat actually makes you look forward to the routine weather message that otherwise doesn’t have any scope for creativity. A full email just with the weather information? Why not! Just have a look at it – The copy is minimal, the graphics are highly engaging, and the message really feels like a cat is talking to you! Their CTA invites you (again, very creatively) to connect outside email. I hate promotional emails that pack huge chunks of text. That’s lazy, almost callous copywriting. No matter how catchy your subject line is, if your email is full text, it’s not going to convert much better. So images are used to connect with our audience. This Postmates campaign takes this interaction to a whole another level – with GIFs! It teases, tempts you about the product. Their text after the GIF is short and peppy. This is such a good campaign, that you will almost miss a 100% delivery charge which doubles the price of the final delivery (read the fine print at the end). If sent at the right times (when people are hungry), this email is sure to convert at a really high rate. When your email list fails to convert, you shouldn’t just give up. 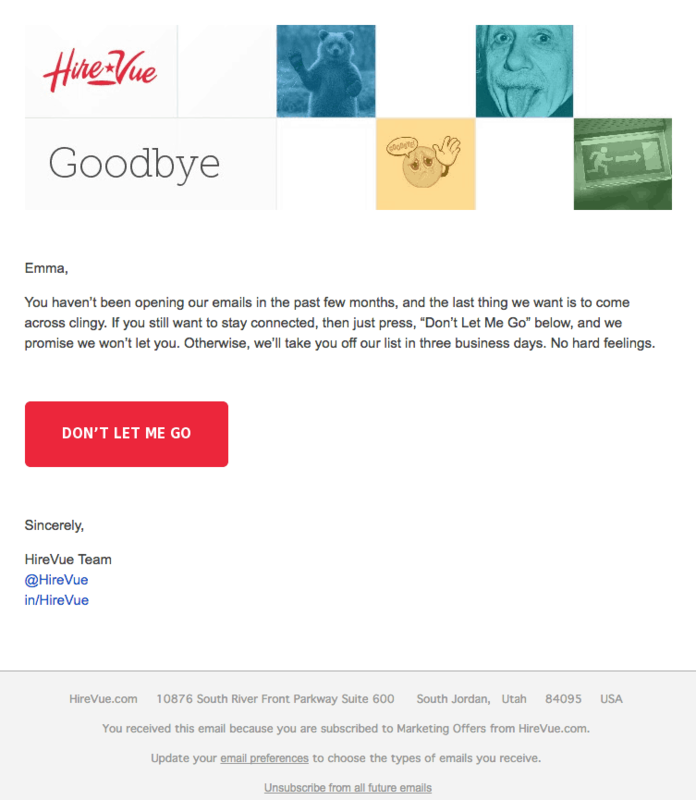 You should do what HireVue did – send unsubscribe emails. When they send this kind of email, the customer has usually lost interest and engagement from them is almost nil, but is still subscribed to the list. The solution from HireVue is an email to attempt to bring the customer’s attention back to the brand. While it may seem desperate, the wording is very matter-of-fact and classy. It is indeed very smart because it uses the psychological trick of “consent” to grab and retain the customer’s attention. If the user clicks on the CTA, he has already said “yes” to an important question asked by the email. Now he will be more attentive when HireVue sends more emails. Subscriber reactivating campaigns aren’t so uncommon; they reignite a dead part of your email list. They need to be done very creatively, or you may risk getting labeled as cheap. 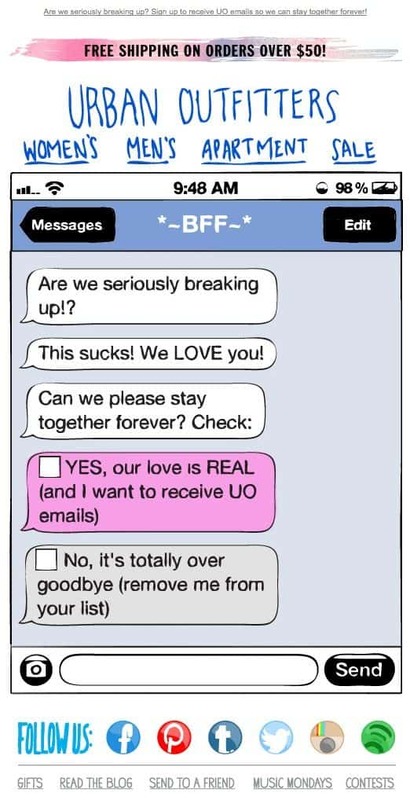 A very good example of a creative reactivating campaign is this email shown below from Urban Outfitters. It shows a chat message window with emotional (non-creepy) messages in a playful font. They have made choices look like checkboxes but they behave like hyperlinks. In the end, the social follow links are also very eye-catching. This is yet another example of why precise messaging delivered creatively always works. 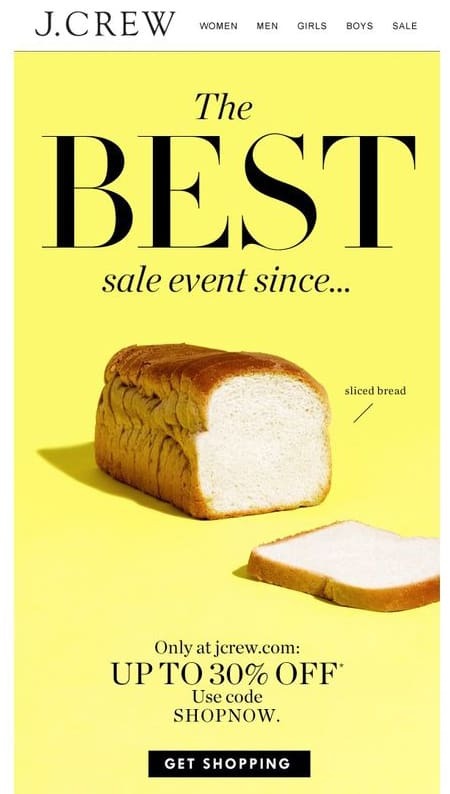 When it comes to creative email campaigns, JCrew seems to be a master of surprise and conquer. In this email below, the graphic is a sliced bread. It has nothing to do with the brand (an online clothing retailer) or the email subject (announcement of a sale). Its only purpose is to be funny. Who doesn’t want to have a good laugh? The CTA is plugged in so brilliantly that it almost guarantees a click every time someone opens the email. GIFs are not only brilliant customer engagement tool for brands, they also help you keep your messaging minimal – a common trait among most successful email campaigns. It grabs attention immediately. Even though the messaging in this Estee Lauder campaign is fairly basic, it’s offering free samples, which everyone loves. While this one is not as minimal as others, the text is very personal, quirky, and not too long. 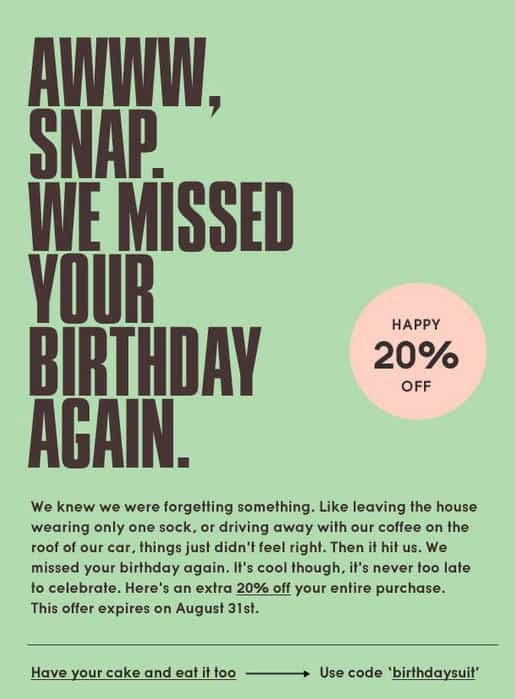 The element of surprise of receiving a birthday coupon after the birthday hits the customer hard and gets him thinking. This is one of the smartest ways of pushing an extra sale each day. Just set a trigger to send these emails every day to customers celebrating their birthdays on that day. As we have seen, it’s not rocket science to generate email campaigns that catch eyeballs and convert equally well. The messaging needs to be visually minimal in its design, and have an element of personality. It could be crazy, it could be funny – it could be anything which people want to see. Imagine the kind of traits your buyer persona would be looking for in a friend and try to project those traits through your email copy campaigns.